Isabels outfit: sort of works, but it would need alteration to truly work. The bodice is snug, though it will close in back (the piece with the lacy ruffle will NOT fit -shoulders on the GOMLs are not as wide). The skirt is snug enough to where it won't snap shut, though one could probably make an extender or sew on a hook & eye set. The crinoline/cage skirt fits, sort of, which helps with the skirt problem. 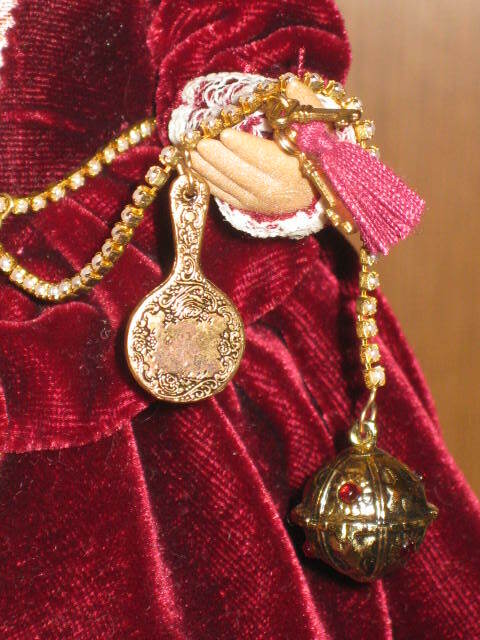 The necklace, though hard to get on, fits perfectly, as does the belt thingy with the pomander, keys, and mirror. End results: Rain kept the necklace, but the rest went back on Isabel. Leyla's turkish robe fits, if you don't mind the hem extending about a half inch past her feet. I think that the shirt might fit too, but something is up with one of the shoes on mine, so I didn't try it on her. The pants I'm fairly certain would not fit, as they are fitted to Leyla (much like Isabel's skirt). The necklaces have no clasp, so I didn't try removing those either. End result: Rain got to keep the robe. 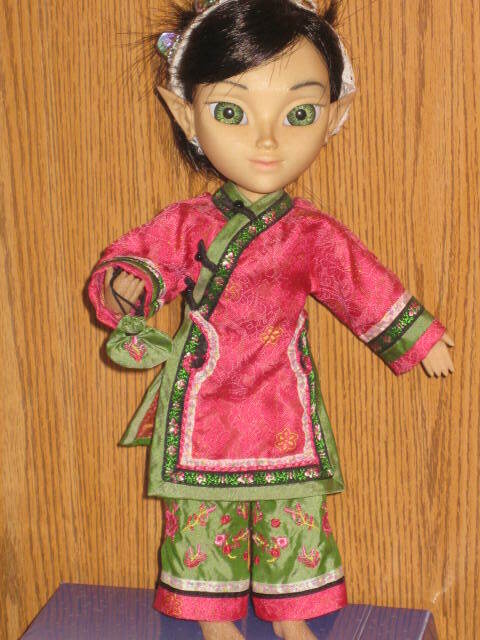 Spring Pearl's outfit fits perfectly. The top is a bit loose, but it looks great! The pants fit like they were made for her, and the little purse is really cute too. Sadly, the matching shoes won't work. Saba's outfit also fits very well. It's a little snug in the waist, but as that has elastic in it, it works. 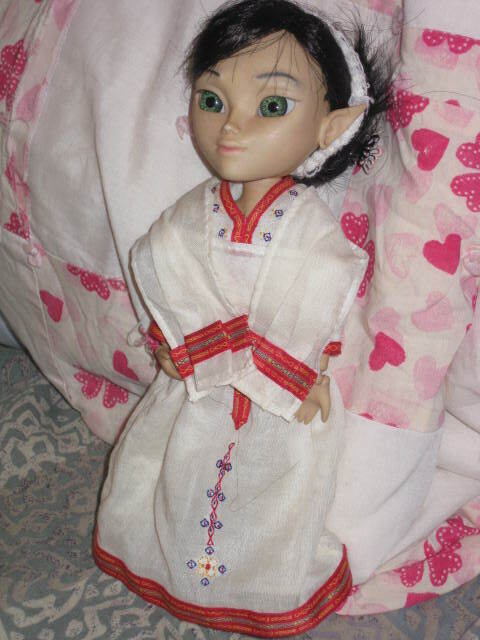 End Result: New dress and shawl for Rain. 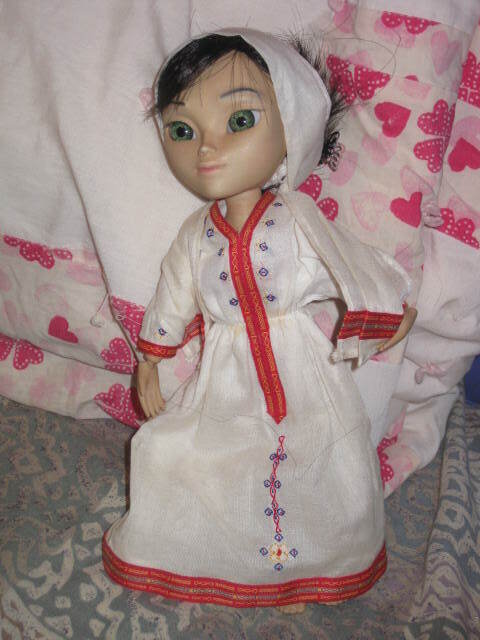 Final Thoughts: The Girls of Many Lands dolls are slimmer than the Makie is. Their feet are also much smaller, so the shoes will not work. Anything fitted, like Isabel or Cecile's skirts, won't work without some alteration. Neela's outfit is too small, although if you really wanted it too, Neela's Choli would work, it's just pretty snug going up. 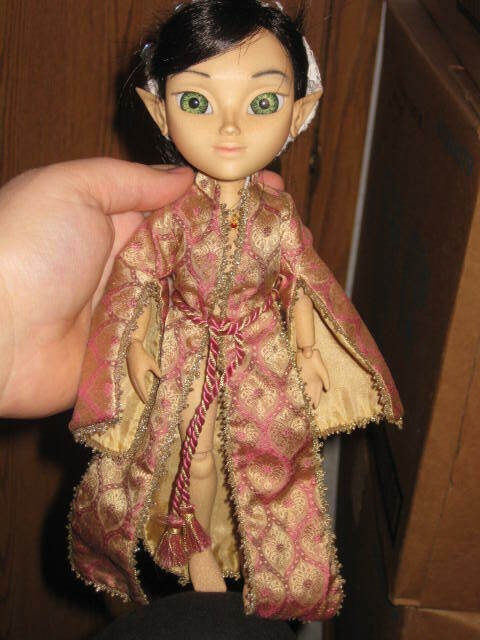 I did remove Neela's gold chain, choker, and gold and ruby bracelet for Rain to use. 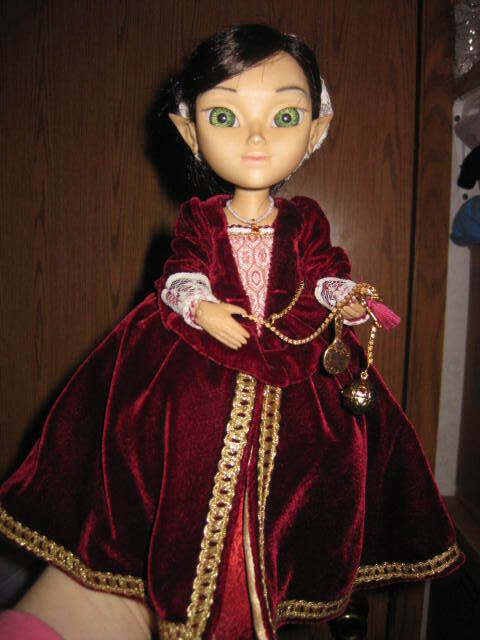 Cecile, I couldn't get the one bracelet off, but I suspect the bodice may fit (probably like Isabel's). 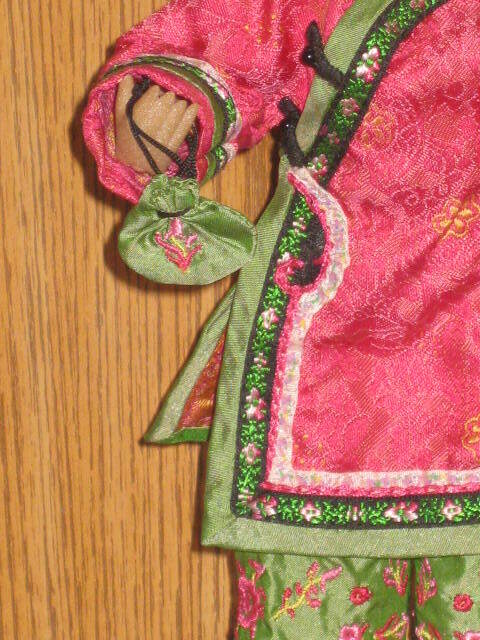 If you have American Girl dolls, or now what they are, Felicity's Christmas dress (the bodice portion) seems to be constructed similar to Cecile's bodice. I did not remove Cecile's pearl necklace, although that likely would have also fit Rain. Minuk's parka is a slipover, so I didn't even try that. Since I didn't, I also ignored the rest of Minuk's outfit, as it's all fake fur. The mittens fit, but I didn't want to take those from Minuk. I don't have, and never have had Kathleen, so I can't even begin to speculate as to whether or not her Irish dance costume might fit. As a last, non-dolly related note, the Girls of Many Land books are enjoyable (I think so, anyway), even if you don't want the dolls.